Croagh Patrick Stakeholders Group Members have completed an evaluation process of the trial path work undertaken on Croagh Patrick in recent weeks. The work was done by Scottish mountain path specialist’s contractor Matt McConway of Upland Access Ltd over a period of two weeks. The trial section of stone pitching is two metres wide, consisting of irregular steps and platforms, using only stone and material from the mountain. Work took place in two locations, along the traditional summit path and at a lower level near the access gate to the mountain. 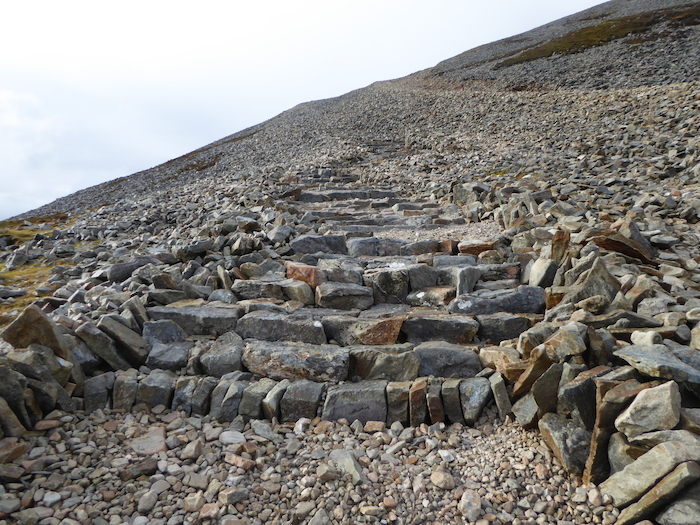 The objective of the trial path work was to establish if the proposed methodology for constructing the path would work using the small stone blocks found on the steep slope of the summit. The path work was evaluated against Helping the Hills (the Guiding Principles for Upland Path work produced by Mountaineering Ireland ) and included the assessing the quality of path work construction technique; landscape impact and environmental impact. It also provided an insight into the value of progressing the implementation of the project with strong emphasis on training and voluntary inputs, building the capacity locally to repair and long-term care for the mountain. The result of the evaluation process is that The Stakeholder Group is confident to proceed with the proposed path solution together with a maintenance and management regime. The Stakeholder Group acknowledged with gratitude the assistance of the Mountain Shareholders; Murrisk Development Association; GMIT Mayo Campus; South West Mayo Development staff and RSS workers; Mountaineering Ireland; Mayo Mountain Rescue and all other volunteers who assisted with the physical creation of the path work. The next steps for the project are to obtain planning approval through Part 8 procedure in partnership with Mayo County Council and then proceed to implementation. Martin Keating, Chairman of Croagh Patrick Stakeholders Group stated: "Since the formation of the group, the Stakeholder Committee has been advising individuals and groups to prepare for their journey, take the right equipment and most of all to respect the mountain. It makes sense for us to take the same approach when thinking about the enormous task of repairing the damage and securing the future management of Ireland’s Holy Mountain. "Rather than rush ahead with a quick-fix solution that we might later regret, we have been making careful preparations, taking advice from experienced upland path professionals and doing trial work where bespoke solutions are required. "The recent trial works have confirmed that we have a viable solution to repairing the summit section of the mountain, and they have given the stakeholders confidence to move forward to the planning and implementation phases of the project. "This approach also provides us with an opportunity to train people in the highly skilled methods of upland path development and repair, which sets in motion the long-term relationship that we need to have with Croagh Patrick. "Like the pilgrimage itself, this will be a hard journey that will test our resolve, so laying solid foundations has been essential. In keeping with the holy nature of Croagh Patrick, our preferred solution retains the pilgrimage experience together with the character of the landscape and will be accompanied by ongoing measures to foster an understanding of the significance of the mountain, as well as the part we all need to play in looking after it.